Last winter, as part of a family ski weekend in Maine, Lucas St. Clair, his wife, Yemaya Maurer, and assorted siblings built a snow cave for six. They picked a flat open spot protected from the wind on one side and with a view over a wilderness lake on the other. Starting early on a winter afternoon, the group piled snow high and packed it down. They drank hot chocolate while the snow dome hardened. Several hours of sweaty digging out later, their sleeping quarters were ready. The group spent a warm night under the snow, and although they skied out the next day, the structure they created could have housed them many more nights — and, at a constant temperature right around freezing, in relative winter comfort. St. Clair and Maurer were well qualified to lead that family construction project. Outdoor leadership instructors, they’re the co-authors of The AMC Guide to Winter Hiking and Camping. St. Clair and Maurer know that snow is a paradoxically wonderful building material, as children seem to understand intuitively: Snow can be hard or soft, is easily molded yet sturdy, and, though the product of cold, can be a surprisingly good insulator. Children and families can create snow structures as close to home as the backyard or on winter getaways. Whether it’s a simple two-sided snow fort or the domed cave that St. Clair and Maurer and their relatives built, all you need to become your own snow builder are a few simple steps, a handful of household tools, and some basic safety guidelines. 1. Never construct or play in snow cave alone. 2. Never climb on top of snow caves. 3. Maintain proper ventilation and proper wall thickness. St. Clair and Maurer called their snow cave a quinzhee, after the Athabascan word for the traditional winter dwelling built by native people of the far north. Athabascans created quinzhees by piling up great cones of snow and then hollowing them out. To create their quinzhee, St. Clair and Maurer piled snow about five feet high and a little wider than it was tall. Their group compacted the snow by stomping on it with their skis; snowshoes also work well, as does laying a board over the pile and standing on that. Before starting to dig it out, let the mound sit for at least 2 hours — or even for a day if the snow is light and dry. * Stick ski poles, avalanche probes, or branches 12-18 inches into the snow pile before digging it out. They become thickness markers as the snow cave is being created. * When the snow pile has hardened, start digging a tunnel. Lightweight mountaineering shovels and gardening trowels, even large serving spoons, may be easier for children to use than standard snow shovels. Angling the tunnel up slightly makes it easier to remove snow. Inside the cave, shoveling on one’s knees works well and is safer than lying on one’s back. * Digging out a snow cave is hard work and should never be attempted alone. St. Clair and his family shoveled about four hours to complete their cave. (Smaller caves will take less time.) Working so hard, they had to be careful not to become drenched with sweat and risk hypothermia. Always work in groups of at least two. One person can shovel while another removes snow from the tunnel entrance. In a larger group, someone can check the thickness and overall soundness of the structure — or even build snow sentries (otherwise known as snowmen) to stand guard. * Stop digging out from the inside at the thickness of the sticks or poles. The domed roof of the cave can be several inches less thick than the sides. * Poke ventilation holes (three or more) into the completed structure and make sure that they remain open as long as the structure is being used. The holes left by your thickness markers can serve this purpose as well. * If the temperature is below freezing, pour water over the finished structure to increase its strength. For fun, decorate it with food coloring, or pinecones and evergreen branches. * With thawing temperatures, test the cave. If it has softened to the point that it’s no longer safe, have the pleasure of smashing it in (and keep it from becoming a hazard). * Snow forts — two to four uncovered walls — require less time, less snow, and less adult supervision than quinzhees. Make snow "bricks" by packing snow into plastic bins or wastebaskets, let the bricks air-harden, and set them into place. Snow offers children opportunities to build the playscapes of their imagination — and adults the chance to be a kid all over again. 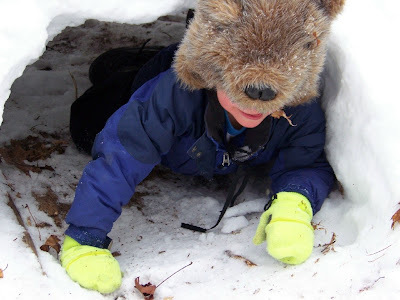 A well-built snow fort or snow cave can be shelter for a night — or fun for a whole winter. Watch a video of St. Clair and Maurer building a quinzhee.